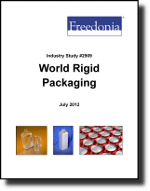 World demand for rigid packaging is forecast to increase 6.4% per year to $472 billion in 2016. The most rapid increases in demand will be seen in developing areas, especially in the Asia/Pacific region. Plastic will be the fastest growing container material, while beverages will remain the largest market.